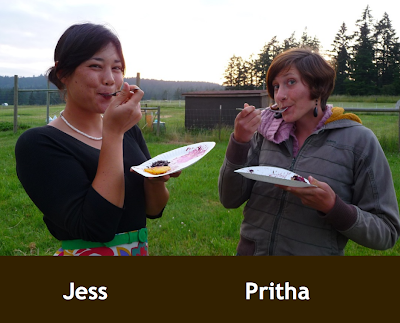 Tonight Pritha and I are giving a presentation at the San Juan Island Library: an intro to Community Supported Agriculture and a farm-fresh cooking demo. If that's not enough excitement for you, click here to download all the slides. They really are spartan, though! Our notes are where the substance's at. None of that nonsense of slides dripping with words so small they can't be seen. We're trying to keep it simple and charm people with our enthusiasm for small farms and chard and community love. After we do a little indoctrination on the wonderfulness of community-supported agriculture, we'll try to further ingratiate ourselves by appealing to the audience's stomach. Pritha's making a simple summer squash soup, and I'm going to do poached eggs on kale and tomatoes, and green beans in thyme and butter. I devoured my test run on the eggs as I started this post -- just a little tomato splashed on my screen as I shoveled from plate to mouth. It's been such a very long time since I've done anything like this. I was over in the tackroom at Heritage Farm last night where Pritha works, both of us huddled over my little black macbook, walking through our "talking points" and feeling like we were in college again. 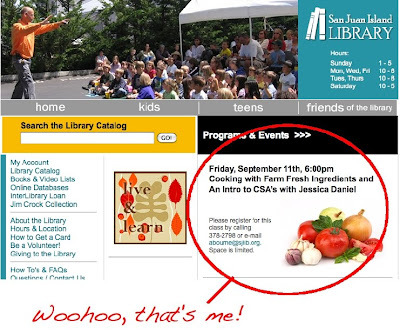 I love that it was so easy to make this happen -- all it took was an email exchange with the lovely library's programs coordinator, Adrienne. She even offered to pay for the supplies for the class. Only on this island! Or maybe not? I should try to do this again when I return to Orange County. I feel like they would cite health code and tell me the fire marshall wouldn't allow an electric burner. Am I too cynical? 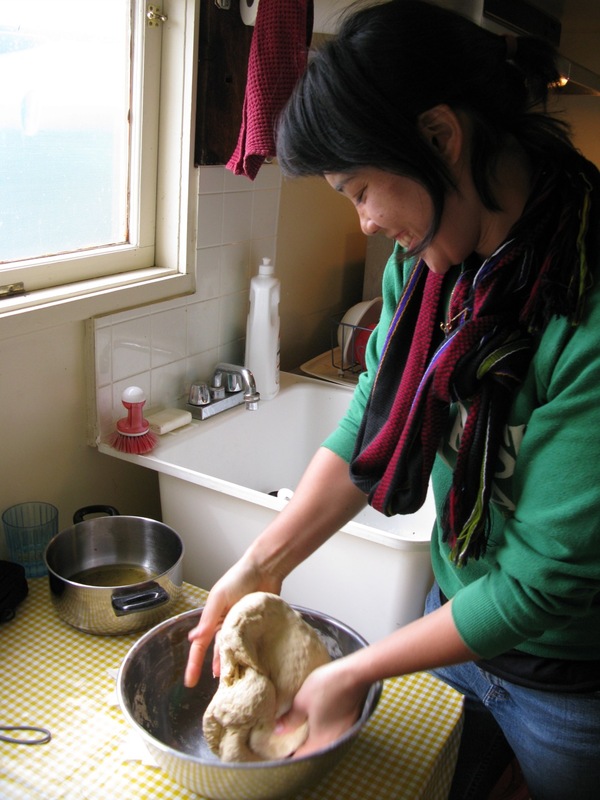 With all these foodalicious sustainabodacious, socially aware thoughts crowding my brain it feels good to force the thoughts into action and do something, not matter how small. What kind of little actions have you taken lately on something you care about? Change a lightbulb? Plant a tomato? I'd love to know. LA's the health-code-crazy county--cf. those stupid signs in the window that show the restaurant's grade. But I doubt the Fullerton library or whatever would allow a food demonstration, either. My girlfriend has some chef friend who does demos in like, Bloomingdale's, but I'm not sure if that's the best place to find people who care about CSAs. Can you post the power point ? Wanna see what you are up to! What have I done lately, hmm.....well I finally started a garden this year, and I commited to buying a side of locally grazed beef. Feeling much better knowing my cow led a good life, and that the meat is more nutritious for my family. Good place to start I guess. Awesome! I'll post the recipes once I finish my road trip back to California. Cool on the beef! My mum just bought a large chunk of a cow from a local 4-Her. I'm psyched to get home and meet the cow. It'll be so different trying to buy locally now that I'm going back to Orange County, but it will be a fun challenge! Back pain is a very common complains of almost every person in the world. It is the agony felt in the CBD oil for back pain from other structure of the spine such as the muscle, nerves, joints and bones. This body suffering could be subdivided depending on the part in which pain could be felt.